We all have hectic stessfull days and the last thing we all want to do is make dinner. Instead of stopping and getting fast food, here is a quick, yummy, and crunchy salad. Blue cheese is my all time favorite cheese. I love the creamy tang of the dressing mixed with the hot and spicy. Wash and chop your romaine. Jullien your celery and carrots. 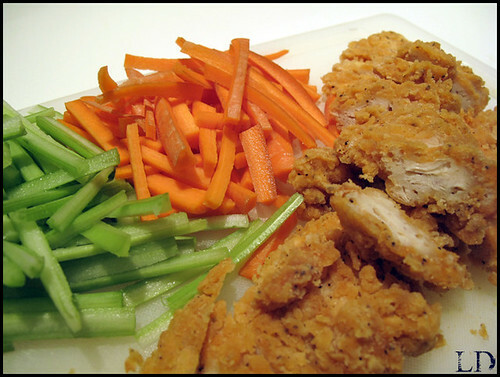 Dice your chicken strips, I buy mine pre- made, remember this is an easy dinner! Place your chicken strips in a bowl and add as much or as little hot sauce as you wish depending on taste. I like spicy so I add a lot. 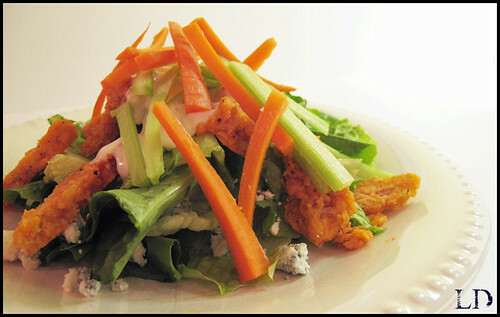 Assemble your salad with your celery, carrots, blue cheese, and dressing, and walla you have dinner. Man my stomach is making all sorts of noises as I scroll through your blog today...lol! :) Yum. This sounds simple and good! book form, at least since the hey-day of the horror cpmics in 1950s. flying dragons, tough dwarves, magical warrior elves, and evven an imaginary language.